County Tyres also offer an industrial tyre service too with Industrial Pneumatic tyres being supplied and serviced from all County Tyre Commercial branches. 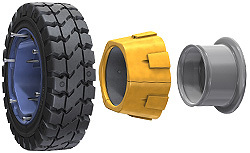 To compliment this, some County Tyre branches are equipped with Specialist Industrial Solid Tyre Presses and can offer a full Industrial Tyre Service package which includes supply, fitting and maintaining a wide range of Industrial tyre products including Pneumatic, Radial, Resilient, Solid rubber and Polyurethane tyres. We are also able to advise the supply and fitment of puncture preventative products all at competitive prices.